The beast. Redefined. That could be the motto of the phone that Sony just announced - an Xperia Z5 Premium with the world's first 4K screen on a phone. Like it or not, 4K is here to stay, and there will be more and more services streaming in 4K, not to mention the new media that is getting created with that definition every day now, or the fact that phones can record 4K video, and the Z5 Premium will be able to display every single pixel captured. 4K might sound like an overkill, but that's where things are heading, and it is hard to say no to "bigger, better, faster, more," so let's recap what Sony just announced. We start off with the screen, as that's where the Z5 Premium's unique selling point is. Imagine those tube TVs of yesteryear, and how news anchors looked a bit smeared and perfect. Well, in 1080p or 4K on your current flat screen they look much more natural and more human as a result, and that's one of the advantages with higher resolutions - things become more lifelike, for the good and for the ugly. 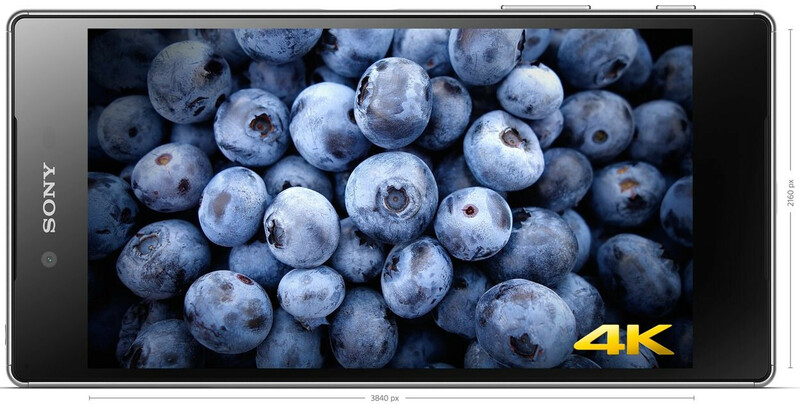 The only display with 4K resolution for mobile we have heard announced, was Sharp's 5.5" panel way back in April. The panel comes with the eye-watering pixel density of 806ppi, but was scheduled for mass production in 2016, while Sony is taking us all for a grand surprise, and has outfitted the Z5 Premium with a a 2160 x 3840 pixels Ultra-HD (4K) resolution display of its own, perhaps a JDI panel, as that's the largest mobile screen producer, and Sony is part of the joint venture there, along with Hitachi and Toshiba. Anyways, the 5.5" screen sports the record-breaking 800+ ppi density, while the current record-holder, the Samsung Galaxy S6, makes do with 577ppi. Xperia Z5 Premium will also upscale your content to 4K, enhancing any native or third party videos or photos so you can view Netflix, YouTube or your personal footage in 4K detail on the 5.5" screen. The Z5 Premium is powered by Qualcomm's latest Snapdragon 810 chipset. The processor has had its troubles with thermal management, so we are curious what has Sony done to avoid throttling it too much - it has to power a 4K display after all. There are 3 generous GB of DDR4 RAM in the flagship, and 32 GB of storage, along with a microSD card slot for expansion. Sony's newest 23 MP Exmor RS sensor makes a cameo in a Sony flagship for the first time exclusively for the Z5 trio, and we can reasonable expect extremely fast performance, as the phone will sport phase detection autofocus with 192 focus points. Sony promises 0.03s focusing times, which is extremely fast indeed. The Xperia Z5 Premium is a tad on the large side for a 5.5-incher at 154.4 x 76.0 x 7.8 mm, and quite hefty at 180g., yet you are getting a premium waterproof chassis, and a large 3430 mAh battery that can keep the 4K phone going for Sony's typical two days of endurance, so no complaints. Price and release date for the first 4K handset on the market will be coming soon - Sony said that the Xperia Z5 Premium will launch globally from November 2015, so stay tuned. What do you think, would you get one, be it only for the 4K display, but also for the long battery life or the new 23 MP Sony camera? Riccolo said it was more than 3400mAh. Sony use Quantum dot display for their phones ( the last time I read) and QD display is more efficient than both conventional LCD and OLED display ( there are bunch of articles on the net about their power efficiencies). My biggest concern is SD810 power hungry a57 cores. I just hope they decreases their frequencies. Crap, it's also 180 grams, that and its only 5.5"
Sony's screens as proven on the Z2 and Z3 aren't as power hungry as your typical LCD panels. My concer would be SD810, we all saw the horrific decline in battery life in the Z4 which used the same screen as the Z3. But hopefully, just as Sony did a remarkable job in controling the heating issue with SD810, that they also found a solution to it's battery eating issue. They must've done something to fix the heat issues, because the Z5 is 7.3mm and has a smaller battery than the Z3+ which is 6.9mm. More thermal padding? I mean for the same thickness as the Z3, it lost 300mah. I am not sure what it is, but I am hoping for a Z3 like battery performance. Z5 or Z5 Premium for you? If the Premium has similar battery performance to my Z2, I'll definitely be picking it up. If not, I'll wait until the Z6. Thanks. Indeed 3.430 won't be enough to match the 2 day battery life they say with 4k... The worst part is the availability in 3 months !!! Exactly when all the rumors on the Z6 with SD 820 will be in full swing. FAIL. I think that it will use the 4K resolution only with 4K content, and for the rest of the day it will use 2K resolution via special mode. The article clearly states that non 4k content will be upscaled to 4k. give me avg battery life and take my money ! Z5 premium!!! Same here. Give me a 5+ hrs of sot, and I am definitely ditching my Edge for this beast. Watched some hands in videos already, the camera is brilliant, and they did pretty good job in eliminating the overheating of SD810. Hands down, best phone for 2015. Not the one on the Z5 ;) Watched bunch of Z5 and Z5 Premium videos already, none of them ended up overheating, even under 4k video shooting tests. If they can bump the battery a bit put a sd 820 in it and release on all major carriers next year they have a winner with this phone way to go sony about time! Am I dreaming? 4K? On a mobile? wow higher then galaxy S series,and iphones. Gimme that same good battery life and a great camera and you'll have my money. No overheating. BTekt just posted a 4k video shooting test, it reached the 10 minutes mark without overheating or shutting down. Great job Sony, brilliant. It is. Btekt even said that this is the 1st phoe he ever tested to get to the 10 minute mark without overheating or shutting the camera down. It did get warm, but it is an achievement for a smartphone to not overheat while 4k shooting. DIS does a great job on the new Z5, also saw a moving 4k clip, and it was steadier than the majority of what other OIS armed flagships can give you.